Slumping glass involves heating a glass object at a high enough temperature to melt and bend the glass into a mold. A slumping kiln is one that will attain a temperature between 1,200 and 1,300 degrees F. Maintaining the temperature for a minimum of an hour will provide adequate time for the glass to slump into the mold. A homemade slumping kiln made from a cast iron wood stove and brick will reach and maintain the needed temperature. 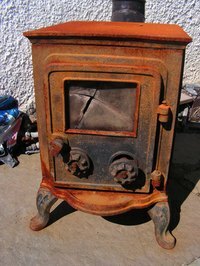 Put the cast iron wood stove on a flat, safe surface. Lay a piece of newspaper over the top of the stove. Trace around the outside edge of the stove top and the shape of the chimney opening. Cut out the templates. Lay the templates on a piece of 1/8-inch sheet metal. Trace around the outside of the templates to transfer the shape to the sheet metal. Plug all the holes in the wood stove with heat resistant caulk to make it as airtight as possible. Lay the piece of cut sheet metal over the chimney opening. Stack a row of bricks around the outside edge of the cast iron stove top. Stack the bricks in a staggered fashion 10 to 12 rows high. Place one brick on the sheet metal covering the chimney opening. Do not mortar the bricks into place. Look down into the opening. Place two bricks on the bottom of the bricked area to hold the glass slumping mold. Place the prepared glass mold on the two bricks. Put the sheet metal cut to the shape of the cast iron stove top over the top of the brick wall. Stagger a layer of bricks over the top of the sheet metal. Fire the glass slumping mold slowly. Start with a small fire and continue to stock until the chamber begins to glow red. You will see the red glow through the openings between the bricks. The process takes approximately six to eight hours. Let the fire die down naturally. Remove the brick from the top of the sheet metal, then the sheet metal top after the slumping kiln is completely cool.